OBJECTIVES: The aim of this study was to describe use of chiropractic and/or osteopathic manipulation by children in the United States along with the specific health conditions for which they sought care. METHODS: The study was a secondary data analysis of the National Health Interview Survey 2007, Child Alternative Medicine file as well as the Child Core Sample. National population estimates were generated for reported use of chiropractic or osteopathic manipulation (C/OM) by children for specific health conditions. Odds ratios (OR) and 95% confidence intervals (CI) were generated from binary logistic regression models that assessed the likelihood that children of specific characteristics would use this therapy. RESULTS: National estimates indicated that 2.3 million children (2.3%) in the United States had used C/OM in 2007. C/OM was the most common complementary and alternative medicine procedure. Children aged 12–18 years were more likely to have seen these providers than were younger age groups (OR=3.4 [95% CI, 2.1–5.5]). Homeopathy (1.2%), massage (1.0), and naturopathy (0.3%) were the next most common procedures. The most common complaints were back and neck pain. Other conditions for which children were seen included other musculoskeletal conditions, sinusitis, allergies, and nonmigraine headaches. Racial categories did not differ significantly regarding use of manipulation, but those children with both mother and father in the household were more likely to have used this form of care (OR=1.7 [95% CI, 1.1–2.6]). CONCLUSIONS: C/OM is primarily used for back and neck pain, which is increasing in prevalence in children. Teens are more likely to use it than are younger children. Among the most common uses of chiropractic care in general are for back pain, neck pain, other musculoskeletal pain, and headaches. [4, 6] However, it has been suggested that pediatric or adolescent populations may present with a broader variety of complaints, including nonmusculoskeletal conditions. Currently, there is a call by both pediatric and chiropractic groups for more research in the area of adolescent/ pediatric care by doctors of chiropractic (DCs). [8–10] Of particular interest is to identify the characteristics of patients who see DCs, their reasons for seeking care, and the frequency and duration of that care. Although some large national data sets do include chiropractic, detailed information on patient and practice characteristics is often unavailable for analysis. The most recent National Health Interview Survey (NHIS), one of the few national surveys to include CAM-related questions, combined response categories related to manipulation to include chiropractic and osteopathic manipulation. The NHIS has a subset that queried pediatric use of CAM and the types of conditions for which it is used. The purpose of this study was to describe use of chiropractic and/or osteopathic manipulation by children in the United States along with the specific health conditions for which they sought care, as reported within the NHIS- 2007. This study was a secondary data analysis of the NHIS 2007. The ASCII Data sets of the NHIS 2007 Person file, Adult and Child Alternative Medicine files, as well as the Child Core Sample (CCS) were imported into the Statistical Analysis System, version 9.1.3 (SAS Institute Inc., Cary, NC) and merged into a single data set. Only observations (respondents) having records in the Child Alternative Medicine file and variables relevant to answer the research questions were retained. These included children aged < 18 years. The study was approved by both the research committee and the institutional review board of the institution at which the analysis was performed. The variables retained included sociodemographic variables such as age, gender, race/ethnicity, geographic location, and citizenship status; parental presence in the family, parents’ level of education, and whether or not the respondent saw a practitioner for chiropractic and osteopathic manipulation, as well as other CAM therapists, within the past 12 months. Most of the imported variables were recategorized or re-coded to address the specific aims of this study. In the NHIS 2007, children or their parents were asked whether the child had seen a practitioner for chiropractic or osteopathic manipulation in the past 12 months. A separate variable in the CCS queried whether or not the child had specifically seen or talked to a chiropractor. Responses considered valid for this analysis were "yes" or "no" for each of these variables. Other responses such as "unknown," "not certain," or no responses were coded as missing and eliminated from the analysis. The variable "saw practitioner for chiropractic/osteopathic manipulation" constituted the main outcome variable. However, a supplemental outcome variable was defined for an affirmative response to "currently using chiropractic or osteopathic manipulation" if a respondent indicated in the CCS that they saw/talked to a chiropractor or indicated they saw a practitioner for chiropractic or osteopathic manipulation in the child CAM sample. A separate variable queried the respondent as to whether they saw the practitioner for treating a specific health condition. These data were captured for a number of CAM therapy options, as indicated in Table 1. Respondents were also questioned on the specific health conditions for which they saw the practitioner, using a closed-ended list format with an option in which they could specify "other" conditions not on the list. Data were also collected for a number of demographic variables that might predict the use of chiropractic and/or osteopathic manipulation in general for children in the United States. Information on race/ethnicity was collected by a method consistent with the procedures used by the Census Bureau to create the Modified Race Data Summary File used for population control ; these categories were as follows: Whites (non-Hispanics), Blacks, Hispanic, Asian, and Others. Age was a continuous variable that included entry from 0 years. The United States Centers for Disease Control and Prevention defines adolescents as ages 10–24. This variable was re-categorized, as the data sets excluded ages 18 years and older, as follows: "≤ 10" and "> 10–< 18 years. For an additional set of comparisons, age was divided into three categories to evaluate care for preschool children (≤ 4 years); school age children (> 4 years and ≤ 12 years); and adolescents (older than 12 years and under age 18). Two (2) separate variables captured whether the child was covered by the state’s children’s health insurance program or had any health coverage within the past 12 months. Child level of education was assessed by a variable that categorized "never attended school or less than kindergarten" as one level, 1st–8th grade in one, 8th–12th grade (high school) in another, and greater than 12th grade or at least some college, in another category. NHIS collected data in clusters of geographic locations that included Northeast, Midwest, South, and West regions of the United States. Parental presence in the family was also noted as "mother, no father," "father, no mother," "mother and father," and "neither mother nor father." Mother’s and father’s level of education were recorded as separate variables and were re-coded as ≤ 8th grade, high school graduate/general education diploma recipient, college education (including technical/vocational), degree (associate/bachelors), and graduate education/ master’s, professional, or doctoral degree. For each of the variables above, responses that did not fit into the defined categories were coded as missing. Data analyses were performed using the Statistical Analysis System (SAS) software, version 9.1.3 (SAS institute Inc., Cary, NC). National population estimates (NPE) (weighted frequencies) were generated using the NHIS survey weight, for all variables, and included weighted percents and standard errors. Numbers reported in the Results section are NPEs unless otherwise stated. Odds ratios (OR) and 95% confidence intervals (CI) were calculated using binary logistic regression models to assess the likelihood of children reporting having seen a practitioner for chiropractic or osteopathic manipulation within the past 12 months as a function of each of the demographic variables. The survey regression model was also used to assess the relationship between reported usage of chiropractic and osteopathic manipulation and age. The statistical significance of each assessment was evaluated based on the 5% level of significance. A total of 9,417 child records (respondents) as found in the Child Alternative Medicine file of NHIS 2007 were analyzed. This resulted in a NPE of over 73.7 million children. Table 1 indicates the 10 most commonly utilized CAM modalities. Chiropractic/osteopathic manipulative therapy was the most commonly reported CAM therapy, with 2.8% (approximately 2 million) reporting an affirmative response to the question, "During the past 12 months, did [respondent] use chiropractic or osteopathic manipulation for a specific health problem or condition?" Of those who reported seeing either or both of these practitioners, 83.8% (approximately 1.4 million) also noted seeing a chiropractor in the CCS. Approximately 300,000 who indicated in the CCS that they saw/talked to a chiropractor did not indicate in the child CAM sample that they saw a practitioner for chiropractic/ osteopathic manipulation. Thus, the supplemental variable, as defined in the Methods section, resulted in 3.1% (over 2.3 million) of children in the United States having used chiropractic or osteopathic manipulative therapy in 2007. Of those who had used chiropractic or osteopathic manipulation in the past 12 months, 58.0% (approximately 1.2 million) provided a response to the question, "During the past 12 months, for what health problems or conditions did [respondent] use chiropractic or osteopathic manipulation?" Table 2 lists the conditions for which users sought care. In this sample, chiropractic/osteopathic manipulation was used most commonly as treatment for back or neck pain (55.0%), with 15.6% using this therapy for other unspecified musculoskeletal complaints, and an additional 11.5% for other unspecified nonmusculoskeletal complaints. Use of this therapy as a treatment option for sinusitis was reported by 4.0%, head/chest cold 3.5%, other chronic pain 2.2%, and allergies 2.1%. 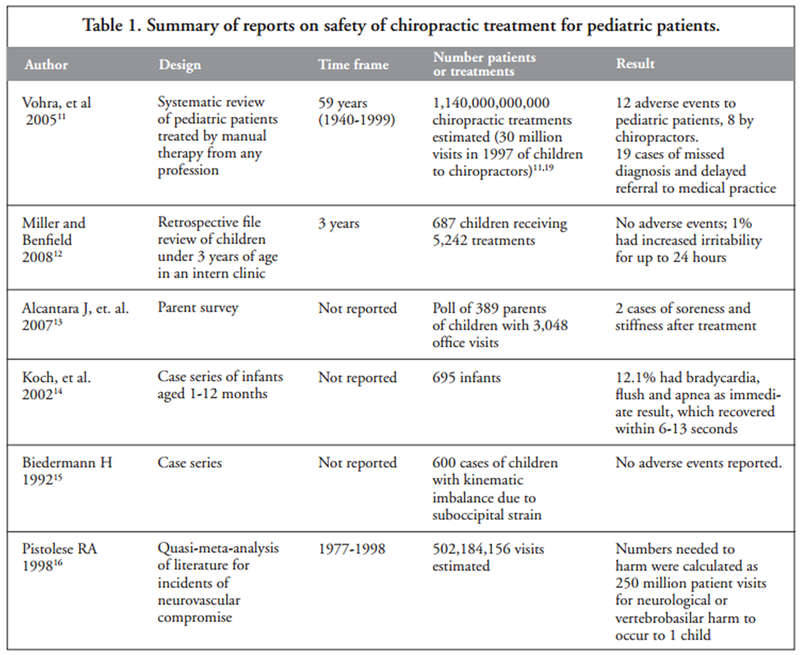 Table 3 summarizes the demographics of children who reported having seen (users) or not having seen (nonusers) a practitioner for chiropractic or osteopathic manipulation for the treatment of specific conditions. Parent present in household and age of child. When both mother and father were present in the household as compared to mother alone, children were more likely to report use of manipulative therapy (OR = 1.7 [95% CI, 1.1–2.6]). If the child was > 10 years as compared to ≤ 10, they were twice as likely to have used manipulative therapy (OR = 2.0 [95% CI, 1.4–2.8]). In the three category comparisons using preschool age ( ≤ 4 years) as referent, school-age children ( > 4 to ≤ 12 years) were 1.7 times more likely to be seen for manipulation (95% CI, 1.1–2.8) and teens ( > 12 and < 18 years) were 3.4 times more likely to have been seen (95% CI, 2.1–5.5). Racial/ethnic demographic. All nonwhite categories reported significantly less use of manipulative therapy: Hispanic versus referent group white (OR= 0.3 [95% CI, 0.2–0.6]); black (OR = 0.2 [95% CI, 0.1–0.3]); Asian (OR = 0.14 [95% CI, 0.1–0.4]); others, (OR = 0.5 [95% CI, 0.1–2.7]). Parental education—father. When the father was a highschool graduate, compared to eighth grade or less (referent) education, they were no more or less likely to have a child treated with manipulation (OR = 1.1 [95% CI, 0.4–3.0]); nor if a college graduate (OR = 1.5 [95% CI, 0.6–3.9]); nor graduate degree (OR = 2.1 [95% CI, 0.8–6.0]). Parental education—mother. Children whose mother had a high-school education versus eighth grade or less (referent) were no more or less likely to have been treated with manipulation (OR = 1.3 [95% CI, 0.4–3.8]); college degree (OR = 2.6 [95% CI, 0.9–7.4]); graduate degree (OR = 1.9 [95% CI, 0.6–6.3]). Children’s state health insurance program. Children who were enrolled in a state children’s health insurance program (CHP) program were less likely to have been seen for manipulation than those not enrolled in a CHP plan (OR = 0.7 [95% CI, 0.3–1.8]), but this difference was not statistically significant. The chief limitations of this study were related to the construction of the questions available for analysis. First, chiropractic and osteopathic manipulation was combined in a single variable, making it impossible to make conclusions about the characteristics or complaints of patients of either practitioner. This is an important distinction, since osteopathic scope of practice includes the use of drugs and surgery as well as manipulation, so it is possible that patients who see osteopathic practitioners for manipulation might have different characteristics and chief complaints than those who see chiropractic practitioners. Even though it was estimated in the 1990s that > 90% of spinal manipulation in the United States was performed by DCs, the proportion of osteopathic physicians using manipulation may be higher at this time. [14, 15] This report’s finding that the CCS subset showed an additional 300,000 children who reported use of chiropractic — who had not reported this on the NHIS question about use of chiropractic/osteopathic manipulation — even suggests that it might have been confusing to respondents to combine the two professions. Second, the use of an at least partially closed-ended question for the complaints for which respondents used manipulation may have limited the information available. Evidence of this is that the third largest category of complaints was those unspecified on the list. The current analysis indicated that chiropractic and/or osteopathic manipulation was the most common CAM procedure reported. Older children, especially teens, were much more likely to report use than were younger children, and nonwhite racial/ethnic groups were less likely to use it. Most reported care was provided for back and neck pain or other musculoskeletal conditions. However, a small minority reported care for nonmusculoskeletal conditions such as sinusitis, colds, or allergies. A 2002 study suggested that chiropractors in general were marketing to parents and that ad campaigns were increasing the numbers of children seen, suggesting further that approximately 20 million children were seen by chiropractors in 1993. This is hard to reconcile with the estimate in this article, based on the NHIS, of approximately 2.3 million in 2007. The fact that back or neck pain is commonly treated in this age group is not surprising, as studies indicate that back pain is increasing in prevalence among the pediatric/adolescent population. Studies have indicated that > 20% of children aged 12–15 years have lower back pain, and the 1–month period prevalence may be higher. Jeffries and colleagues reported idiopathic adolescent spinal pain to be fairly common, and that lifetime prevalence of lower back pain may range from 7.4% to 78.2%, depending on the study cited. Neck pain was less common among adolescents, but thoracic pain ranged from 9.5% to 72% in this population. Chiropractic care was number 4, after herbal preparations, massage, and megavitamins. This amounted to 20.9% of their sample having specifically seen a DC at some point in their life. Also, consistent with our findings, alleviation of physical pain was the primary reason for care. This seems indicative of most manipulative services being rendered by DCs and not other provider groups. The data analysis in the current study, which combined the CCS subset with the larger NCIS sample, may also indicate that a larger number of children have received manipulation than has been previously reported. A 2001 practice-based research study of the prevalence of nonmusculoskeletal complaints among 7,651 chiropractic patients, found that in those < 14 years of age, back pain was most the most common chief complaint, followed by neck pain, and then other nonmusculoskeletal problems such as ear infections, colds/upper respiratory infections, and allergies. Chief complaints for the 15–19–year-old range in this study were almost exclusively back, neck, and musculoskeletal conditions. Pohlman and colleagues surveyed 218 DCs who hold postgraduate certification in care of children in 2010, via an online survey. This certification required 2–3 years of postgraduate education in the area of pediatric chiropractic. Even among this group of DCs with certification in pediatric care, less than 40% of their patients were children; 24% were < 5 years old, and 15% were between 5 and 18 years. This is at odds with our findings that use was more common among older children; perhaps chiropractors who specialize in pediatrics tend to see younger children than do chiropractors who have a more general practice. Of their population of patients under 19 years of age, 57% had a caregiver or parent who also received chiropractic care. Consistent with the current study’s findings, at least with respect to the two most common conditions, providers most frequently (one to three patient visits per month) saw patients with back or neck pain, asthma, birth trauma, colic, constipation, ear infection, head or chest cold, and upper respiratory infections. DCs primarily treat children < 18 years for musculoskeletal problems, with back or spinal pain being the most common chief complaints. They are most likely to see the adolescent subgroups over 11 years of age as compared to younger children. Additional research is needed in a variety of areas. More information is needed as to how chiropractic care affects children, whether practitioners address lifestyle issues, wellness, and primary prevention along with referral interactions with other provider groups. Specific research on safety and direct mechanisms of action are also needed. No competing financial interests exist for any of the authors. Curr Probl Pediatr Adolesc Health Care 2002;32:353–384. Christensen MG, Kollasch MW, Hyland JK. Practice in the United States. Greeley, CO: National Board of Chiropractic Examiners, May 2010. Eymann A, Bellomo MM, Catsicaris C, Wahren C.
Use of alternative or complementary medicine by the pediatric population of a community hospital. Kamodia AK, Legedza ATR, Davis RB, et al. and Adolescents: The Emperor's New Suit? French SD, Walker BF, Perle SM. Modified Race Data Summary File. A Guide for States and Communities. Atlanta, GA, 2004. Shekelle PG, Adams AH, Chassin MR, et al. Spinal manipulation for low back pain. Watson KD, Papageorgiou AC, Jones GT, et al. Jones GT, Silman AJ, Power C, Macfarlane GJ. Are common symptoms in childhood associated with chronic widespread body pain in adulthood? Results from the 1958 British Birth Cohort Study. Wilson KM, Klein JD, Sesselberg TS, et al. Use of complementary medicine and dietary supplements among US adolescents. Braun CA, Bearinger LH, Halco´n LL, Pettingell SL. Adolescent use of complementary therapies. Hawk C, Schneider M, Ferrance RJ, et al. Hartvigsen, J and Hestbaek, L.